My back is getting much better, so I should soon be able to put together a blog post about the knitting side of my holidays. The pattern is Pine Tree Toe Up Socks (Ravelry link), but I’m calling them my mexican socks, because the colours remind me of mexican food — corn ears, chili, red beans. I’ve forgotten what the yarn is. They’re bright and cheery, they’re only my second pair of toe-ups, with a short-row heel that could have been managed better (the first was made for The Husband, who doesn’t feel the irrepressible call to become a sock model), they don’t match and I don’t care, and they bring to me a little bit of the summer I’m yearning for. And they’re especially welcome since I forgot my favorite pair of hand knit socks at my parents-in-laws’, who live some 9’000 kilometers away (so it’s not really as if I could just drop by and pick them up next week). 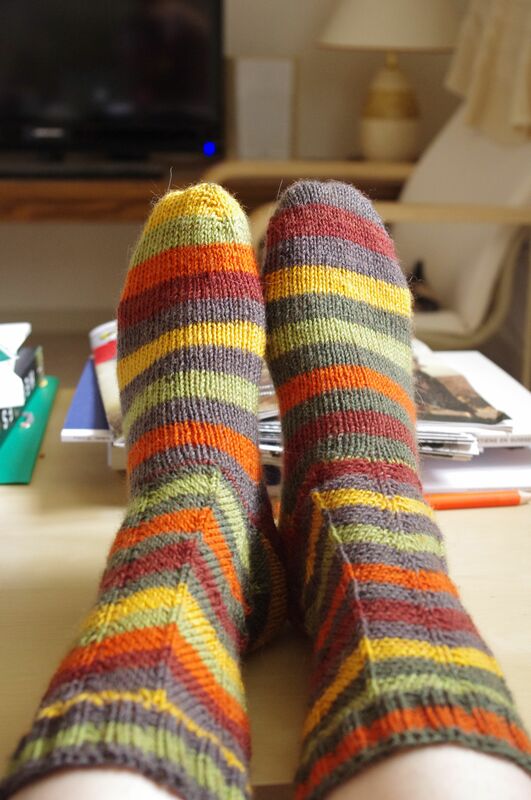 It was just a plain pair of socks, but in a lovely Kaffe Fasset colourway. I had bought the yarn in Jersey, during my first “on our own” holiday trip with The Husband, because it had lovely blue, green and purple hues which reminded me of the island — sea, grass and heather. They fitted me perfectly, were hard-wearing and associated with wonderful memories of a great time in a stunningly beautiful place. I miss them and I hope Mother (that’s what I call my mother-in-law) will safely put them away until next year. In case you wonder why on earth anyone would bring woolen socks on a summer vacation, I have only one word in answer : planes. Planes are cold places. 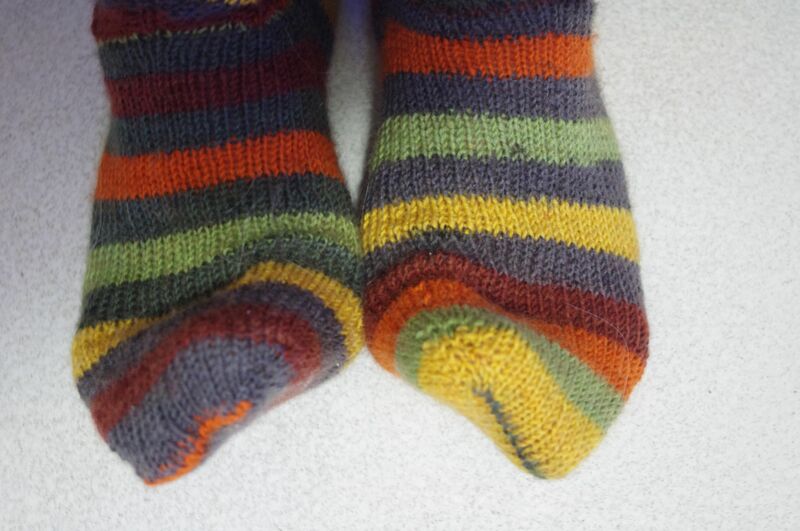 Feet get cold on planes, therefore it is most unwise to board one without a pair of good woolen socks. I nearly panicked on the journey home when I sat in the plane, opened my bag to fish out my socks and realized they were not here. Thankfully The Husband, who, by some mystery of nature, does not get cold feet as easily as I do, even on planes, handed me his own pair, and I was safe. I’m really glad to have this fun new pair as a compensation. The pattern was great, straightforward and easy to follow. I made only a few changes : I didn’t want to have open eyelets on each side of the “spine” featured in the chevron pattern on the leg (because these were meant to be “warm” socks, and holes in your socks kind of defeat that purpose), and I purled every yarn over through the back loop on the following wrong side row so as to twist the stitch and thus close the hole. 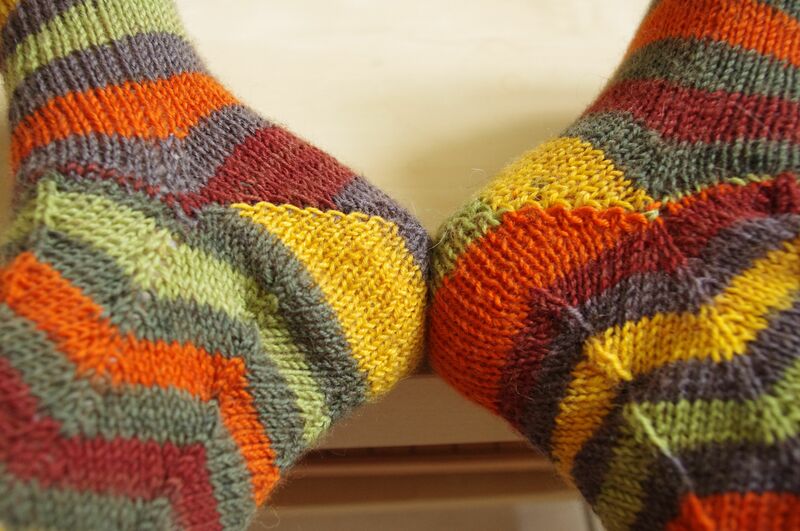 This meant that the pattern would be loosing some of its stretch in terms of width, and that I would have to add an increase row after turning the heel, so that the sock would be neither too loose on the foot nor too tight on the leg. It took me two unsuccessful tries to settle on the right numbers, but I got there eventually. Socks are good. I have another pair on my needles, in the most psychedelic rainbow colourway. Very satisfying to knit and the ultimate antidote to bad weather. 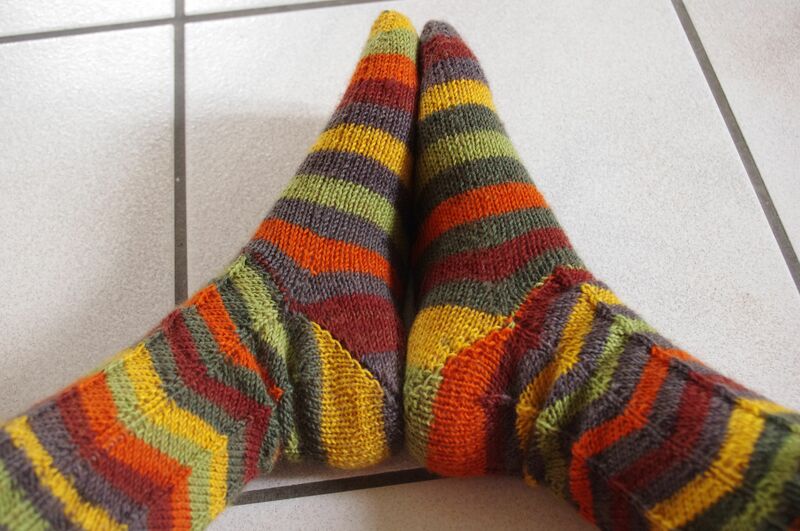 This entry was posted in Finished Knits and tagged socks by Julie Paik. Bookmark the permalink.